As regular readers of AICL know, I'm working on a Master's in Library Science at San Jose State University. This semester, I learned how to use Prezi. It is all-the-rage in presentation-land, but my final assessment is that I doubt that I'll use it for presentations. While it may be more engaging, it also fails to meet accessibility standards for special needs populations. In order to make mine as accessible as possible, I didn't use all the toys in Prezi. My presentation is as straightforward as I could make it. There's more to say about the book than I included in the presentation. That depth will be shared. Later. At his blog, Matt Sakiestewa Gilbert offered a sneak peak at the cover of his new book The Indian School on Magnolia Avenue, due out in the fall of 2012. The Indian School on Magnolia Avenue is not a children's book, but books like it are a must-read for people who work in children's literature. Given the growing body of children's and young adult books about boarding schools for American Indian children, critics of children's literature must know what the schools were like in order to accurately review books set in boarding schools. The children in the photo are shown reading Peter's Family, a basal reader published by Scott, Foresman in the 1930s. Here's some inside pages from a teachers guide (source for the pages is Etsy bookseller PalabrasdeMaria). I wonder if Scott, Foresman thought Native children would be amongst the audience for their books? On this page, the text on the right has the word "Help." We can interpret this page in at least two ways. 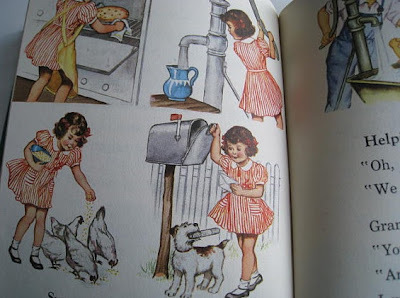 Combined with the illustrations on the left, it suggests that this page is about how children ought to help out at home. That would mean it is didactic or instructional, a "how to be a good kid" sort of thing. Or, we could use today's metaphor of literature as a mirror and could read the page as a reflection of (White) children and what they do. (These early readers did not include children who weren't White.) Although the children shown in the book don't look like the child on the cover of The Indian School on Magnolia Avenue, I bet that child knew all about helping out at home. Part of the goal to "civilize" American Indians meant that they ought to move to cities where they could be Americanized and ride trains and buses or drive their own cars to their places of work. That idea became a federal policy in the 1950s with the Relocation programs by which Native families were moved to urban areas. 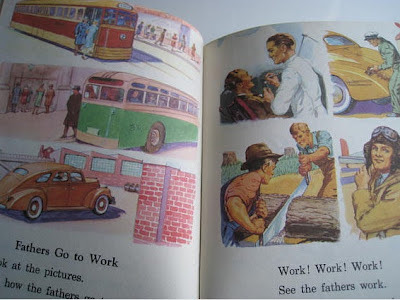 This page of Peter's Family shows that work meant being a dentist, working at a gas station, as a lumberjack, or as a pilot. The public perception might have been that American Indians didn't do anything at all, or, that they were hunters with nothing left to hunt. The fact is, Native men were statesmen and diplomats who signed treaties with their European and U.S. counterparts. They were doctors, too. A good case in point is Carlos Montezuma, a Yavapai man who became a doctor and invented the mentholatum we know today as "Vicks". And, American Indians were pilots in WWII. I look forward to Matt's book. Maybe the cover is a clue that one chapter will be about basal readers or the curriculum. The full title is The Indian School on Magnolia Avenue: Voices and Images from Sherman Institute. Sherman is in California and the school itself is still in operation. One of Matt's coauthors is Lorene Sisquoc. She's the curator of the school's museum. You might want to spend some time at the museum' website: Sherman Indian Museum.